Once again the bad drug trip fantasy of saving Earthlings by colonizing Mars has reappeared in the form of an article entitled, What 11 Billion People Mean for Space Travel. This essay was written by Mike Wall, PhD, evolutionary biologist, who apparently does not appreciate the Rev. Thomas Robert Malthus, who explained Wall's error in the late 18th century. See Malthusianism. Wall's basic idea is that there will be plenty more egocentric billionaires by then wanting to set up colonies in space. There is some precedent for his idea today. However, in this case a change in quantity leads to a change in quality. It is one thing to send small cargos to the International Space Station. It is something quite different to send multiple fleets to distant Mars to seed that hostile environment. At 11 billion population, with an annual growth rate of just one percent, an additional 110 million people will be added to the top of the pile of human flesh every year. That's about 300,000 new hungry bellies every DAY. If the plan is to construct "Eden #2" for 80,000 in an otherwise deadly-to-humans world, what will be the opportunity cost here on Earth? How can anybody justify hundreds of billions of dollars shot into space that otherwise could be better used for improving the ecology of Earth, and for real birth control, and for care of the elderly. Do the math: vanity cannot conquer reality. Don't get me started on the mining-in-space-creates-wealth-on-Earth fantasy, along with the making-steel-in-our-little-trailer dream. There is one very low probability justification for a remote colony of humans. That would be the Earth annihilation hypothesis. The most likely event would be from global thermonuclear war, something that is less likely over time, despite proliferation. Even with a nuclear holocaust, there could be more than 80,000 survivalists left after the nuclear winter. Life on Earth will reset and move forward, hopefully wiser. Other scenarios involve natural doom. Most relate to such things as giant asteroids, an increasingly unlikely problem due to deflection strategies already under development. Even less likely in human time would be such things as gamma ray bursts, an eventual horror, but statistically not likely within the next billion years. Volcanoes can cause havoc, especially super volcanoes such as Yellowstone. None of these will cause the extinction of our species. A sustained event, such as the great volcanic eruptions in India before the asteroid impact of 65 million years ago, is highly unlikely within the next several million years. That leads us to space alien invasions. 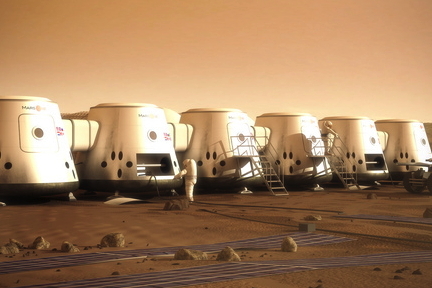 Our Mars colony money might be better spent on ideas for repelling unknown invaders. In any case, future evil invaders could arrive within the next several thousand years. If they can find and kill life on Earth, they surely can find and kill any life on Mars. However, this scenario is highly unlikely, as there would be little or no reason to kill us off, even for access to resources. They could simply reprogram humans. More likely, any visitors will come in peace, almost as angels, because they will already be far more ethically advanced than our killer ape species. Only the comphumans among us will be at their ethical level. There is a fundamental danger in expecting futuristic technology to save us from ourselves. In doing so, we are at risk for delaying and minimizing our efforts to act now on realistic and affordable ways to optimize our lives on Spaceship Earth. We have already screwed up the global environment through denial and inaction. Let's not compound that error with a seductive Mars fantasy.